Whether you're a Buyer or Seller, FINDING the right home or purchaser is what you get with Jim Doxey as your real estate agent. "He showed us a few houses before we looked in Weschester, and he showed us exactly what we were looking for!" Bought a home in 2014 in Gainesville, FL. I remember when I purchased my first home almost 20 years ago. I was young, inexperienced and apprehensive. I was about to turn over my hard earned downpayment and sign a 30 year mortgage. I realized I had no choice but to put my trust in my real estate agent. I never forgot that feeling. 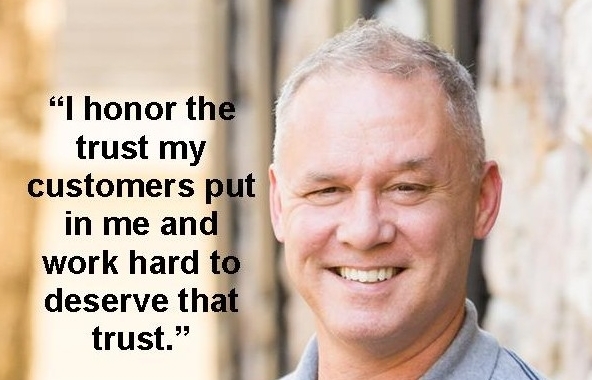 Now, working as a real estate agent, I honor the trust my customers put in me and work hard to deserve that trust. Buying a house is an enormous investment of time and money. It can make or break a couple, family or business and I take that very seriously. Together we will discuss if you are ready to make that big change. I use programs, data, online calculations and other professionals together with my experience, to place you in the best position to buy a home. We will discuss your options, your timeline, mortgage payments, budgets and hidden expenses that can all affect your readiness. We will get you ready, together. I am able to communicate with you through cell, text, email, private message and various social media accesses. It is important that you convey to me your various needs and wants as it relates to the type of home your are looking to purchase. If those needs change, we readjust. New homes become available all the time. You will be notified when a home becomes available that fits your requirements. You cannot waste my time, its my job to find and show you as many homes as it takes to find the PERFECT ONE. "He does not create any pressure, lets you know all the facts and allows you to make your decision in your time." Buying a new home is a huge investment and decision that you have to live with, literally. You will get NO pressure from me to make the decision that is right for you. Whether it's the first or eighteenth home we walk through, my patience comes from ensuring the home you pick is the one you can live with for years. I judge only the home itself and whether it rises to the standard that makes you happy. Sometimes what is advertised is not how the home shows. If it is the first time I've seen the home, I'll help you evaluate if it suits your needs. NEVER compromise what you want! With patience and faith, I am confident that together, we can find your new home. "He worked with us to negotiate with the builders and made sure of timely progress." Bought a home in 2014 in Hague, Gainesville, FL 32653. 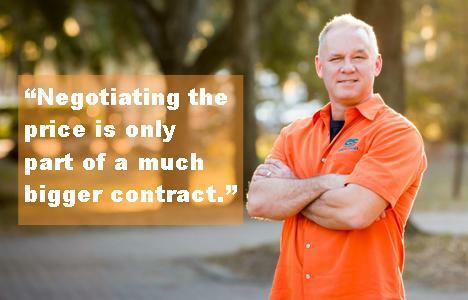 Negotiating the price is only part of a much bigger contract. There are many other terms that need negotiating and can effect the total price. These include closing terms, contingencies, appraisals, title, insurances, associations, warranties, inspections and repairs. Not putting sufficient consideration on these aspects can significantly hurt the deal. They need to be considered when the contract is negotiated BEFORE an offer is presented and acceted or you can find yourself in a position that is not best for you. We sit down and go over all your needs and considerations when making the offer. Any or all of them can have an effect on the price offered and accepted. Faster or later closing dates can effect the offer price. Closing dates are related to your moving dates. Your moving dates can be dependant on things like the kids school schedules and school zones, moving distances, time of the season, mortgage position, just to name a few. Can you lease-back? What position is the Seller in? Seller's moving need can effect what they are willing to accept; have they already bought another home or can they wait? Knowing the right questions to ask can help get your offer accepted. Cash deal? Mortage? Appraisals? Repairs? There are so many considerations and all of these can make or break a deal. Do you want warranties and title insurance, is the home subject to home or land associations, sinkholes, disclosures? How will all of these effect your homeowner's insurance? What kinds of inspections and repair allowances do you want? My extensive experience in all types of closings of short sales, investment purchases, cash purchases, purchases with mortagage contingencies, appraisals, warranties, inspection repairs, etc. helps me to advise you how to structure your offer to make it the best offer possible. My professional connections with other professionals that work in the industry, help to make sure your interests are protected, considered and held to the highest standards at the offering stage. I will help you to understand how buying the home will effect you once you are moved in to your new home. "Jim helped us to navigate the paperwork mountain and to work through the monstrous headaches ..... and we were confident that we were in good hands." Sold a Townhouse home in 2014. There is more to closing than just showing up to the table. Once the negotiations are finished and a contract signed, its time to make sure what you are buying lives up to your standards. I stand by your side from Finding to Closing, meaning I stay an integral part of the process all the way through to ensure you get to the table. "He was incredibly responsive and detailed (since this was out first home, we especially appreciated the checklist he provided us with key deadlines during the homebuying process)." Bought a Single Family home in 2014 in Gainesville, FL. Depending on the deal, I stand by you through the whole process from title verifications, mortgage commitments, appraisals, inspections, repairs, walkthroughs, insurances, home owner association contracts, land surveys, wildlife sanctions, restrictions and land covenants that could effect the property. I watch to ensure events stay on target for closing, oversee repairs, submissions, insurance, leases, appraisals, inspections, final walkthroughs, etc. I work with the Seller's agent or home owner to keep the deal on track. I keep you informed and communicate all the stages with you, before and during all steps. It is important to me that you know and feel that I've earned my commission. 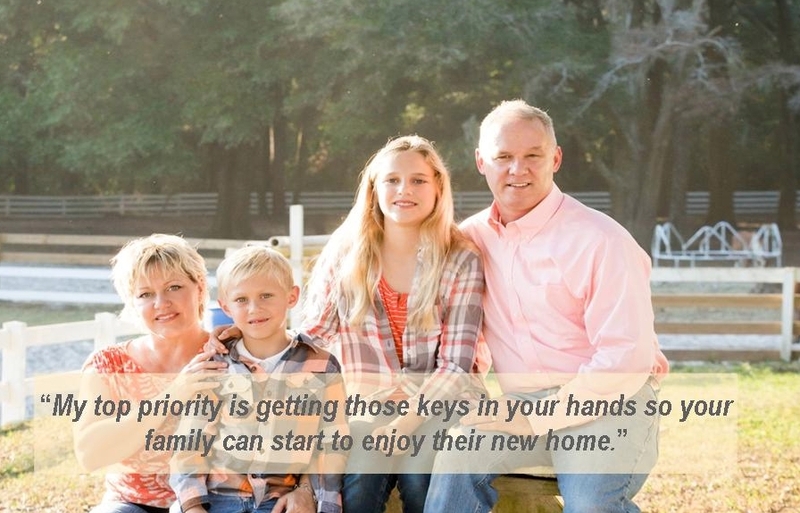 My top priority is getting those keys in your hands so your family can start to enjoy their new home. Its an exciting time to acquire and move into a new home. I want to be sure that its a smooth and easy as posible transition for you and your family.